On July 19, the day before the 11th anniversary of the start of the persecution of Falun Gong in China, Mr. Liu Hongchang visited Slovakia. Mr. Liu spent 5 years in a Chinese prison because he practised Falun Gong. 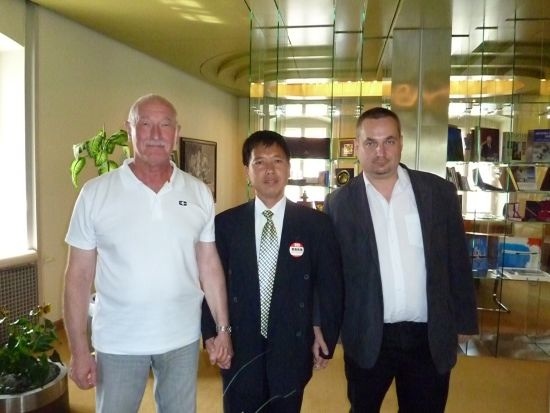 He was received by two members of the Slovak parliament, Mr. Dostal and Mr. Sebej, who heard his story. The MPs expressed their sympathy for the people in China who are persecuted for their beliefs. Later on that day, Mr. Liu met with the vice-premier for human rights issues, Rudolf Chmel, who also expressed his support. "In Beijing, the police asked me if I was a Falun Gong practitioner. I said yes and immediately I was severely beaten and sent to detention in a police van. As soon as I entered the room a policeman came in. Hearing that I was a Falun Gong practitioner, he flew into a rage and beat me cruelly. I was locked in a cell. Two prisoners in the same cell forced me to take off all my clothes and dragged me to squat down under the tap. They turned on the tap, seeking pleasure from my pain and discomfort. I was drenched through with the cold water, and my feet were too numb to stand." "They forced me to bend at my waist nearly 180 degrees till my back and head were against the wall, then spread out my hands in a flying posture. I sweated profusely, my legs were trembling. After that four prisoners kept beating and kicking me until they were too tired to continue." The story of Mr. Liu was also transcribed by a journalist from Slovak radio, who promised to relate it to his listeners.